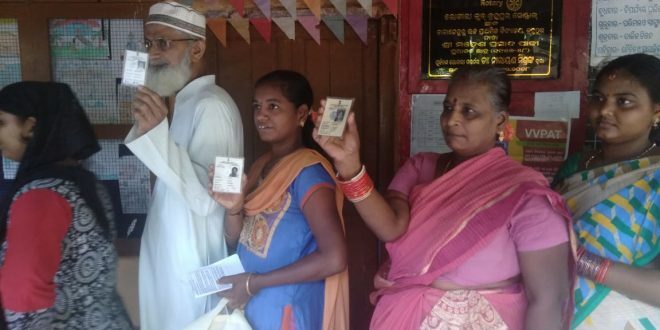 Bhubaneswar: The first phase elections to four Lok Sabha constituencies and 28 Assembly constituencies began in Odisha on Thursday. Polling began for four parliamentary constituencies– Kalahandi, Nabarangpur, Berhampur and Koraput– and 28 assembly seats. A total of 2,375 booths have been identified as ‘Critical Polling Stations’, where security arrangements have been tightened with Central Armed Police Forces (CAPF) being deployed at 777 of those. While 26 candidates are in the fray to contest for 4 Lok Sabha seats, there are 191 candidates in 28 Assembly segments for the first phase. Security has been beefed up in Malkangiri and Koraput districts to check Maoist activities. Lok Sabha and Assembly elections will be held simultaneously in Odisha in four phases on April 11, 18, 23 and 29. Counting of votes will be held on May 23.